This post was nearly titled …exterminate (and if you get that joke, congratulations, you are definitely a nerd), but contrary to many of the reviews out there, I don’t think this movie is quite worthy of the bad rap it’s getting, so the clever pop-culture title was canned. “Terminator Genisys” doesn’t continue the franchise, so much as it restarts it, with enough time travel (and violations of the basic rules that accompany such time traveling) to make the head of even the most avid “Doctor Who” fan spin. What begins in the year 2029, with the final days of humanity’s battle with Skynet (a machine that was meant to protect the planet, but decided it would rather take over the planet), quickly jumps to 1984, and don’t blink or you might miss the leap to 2017. For simplicity’s sake, I’m going to assume you’ve all seen the original movie. Apologies if you haven’t, and you really should before seeing this movie. Consider this your spoiler alert. 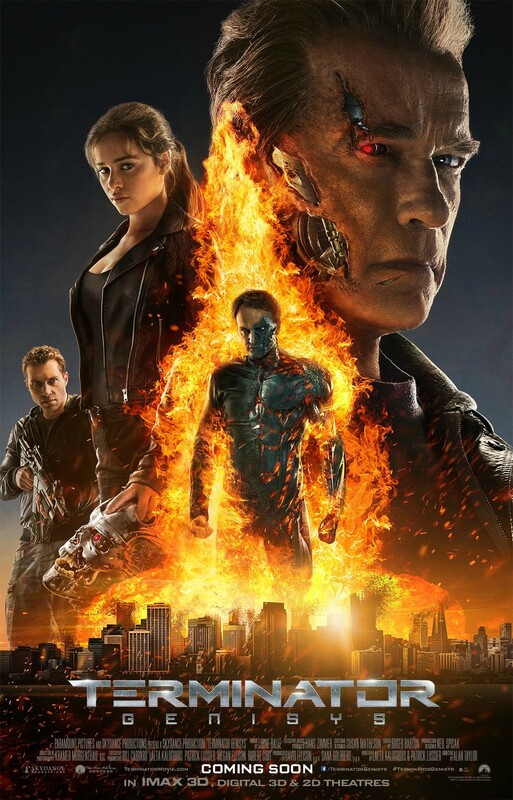 The characters and stories are familiar: Sarah Connor (Emilia Clarke), John Connor (Jason Clarke), Kyle Reese (Jai Courtney), and Pops (Arnold Schwarzenegger)…and that’s where it ends. We’re dumped in a history that’s been rewritten (as you can probably tell from the character name, Pops). Pops was sent to protect a nine-year-old (hence the endearing nickname) Sarah Connor, years before their encounter in the original timeline (is your head spinning yet? ), so Reese who expects to have some explaining to do when he arrives in 1984, ends up being the confused one. I’m sure “Terminator” super fans have more than a few complaints about crimes against the canon, but as an enthusiastic but admittedly passive fan, I though this was a perfectly enjoyable summer blockbuster, with a few awkward moments of dialogue thrown in there to keep us on our toes. Most importantly, this movie filled me with hope for the (not yet confirmed) two sequels. It’s well cast, with a villain that I for one can’t wait to see more of.